After the market adjustment in May and June, supply and demand appear to be in balance at the moment, suggesting a new price level has been reached. After plunging more than 33 percent since the week ending April 21, 2010, the freefall in southern yellow pine lumber prices has abated. Mill2Market, Forest2Market’s weekly lumber price report, shows composite price trends over the last three quarters. --In 4Q2009, the average price for southern yellow pine was $245.08/MBF. --On the week ending January 6, southern yellow pine was fetching $252.18/MBF. This date marks the beginning of the upward trend in prices. --By the week ending April 21, prices reached $393.73/MBF, a 56 percent increase in less than four months. --The week ending April 21 was the turning point for the market, however. Between then and the week ending June 23, 2010, prices fell more than 33 percent to $263.26/MBF. --Prices have moved higher in the weeks following June 23, though only slightly. For the week ending July 7, southern yellow pine composite pricing was $267.84/MBF. This represents a 1.74 percent increase over the June 23 lows. Mill2Market reports southern yellow pine prices based on a Thursday through Wednesday week; price reports are generated on Thursday and published to participating lumber wholesalers on Friday morning. 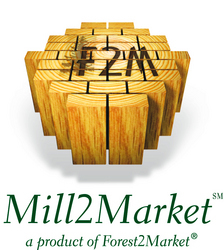 Headquartered in Charlotte, N.C., Forest2Market®, Inc. provides market price information and supply chain expertise as well as a variety of consulting services for those operating in the wood fiber supply chain in the U.S. South and Pacific Northwest. Visit us at http://www.forest2market.com.